TOR has four powerful features. You can remove intermediate revisions during comparing in ‘compare two revisions’ mode. To do it, simply press ‘Thin Out’ button. By the way, you would find Japanese words in the picture above. You can attach a memo to revisions like this by Revision Memo feature of TOR. You can also remove each revisions except current one in Edit Post screen. 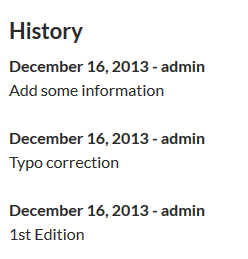 You can remove old revisions on the fly or daily as a scheduled task. The Revision Memo feature enables you to put a short text note on revisions. You can see memos in Edit Post (Edit Page) screen like below. 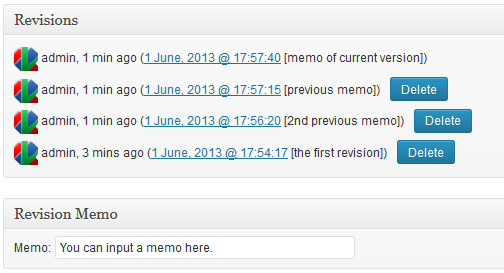 Make sure that you check the ‘Revision Memo’ screen option in Edit Post (Edit Page) screen. Additionally you can edit it later. From TOR 1.7, you can show memos on your post. After turning on this feature, you can choose a default action, show or hide. The default action will be overridden by settings of each post. Your post will be followed by memos like following. Memos are listed as DL, following ‘Header for Notes’. Please note that some kinds of tags will be removed from ‘Header for Notes’ for security reason. In addition, TOR works fine in multisite environment. Why don’t you download it today? If you like it, please share it among your friends by doing ‘Tweet’ or ‘Like’ from this page. It will encourage the author a lot.